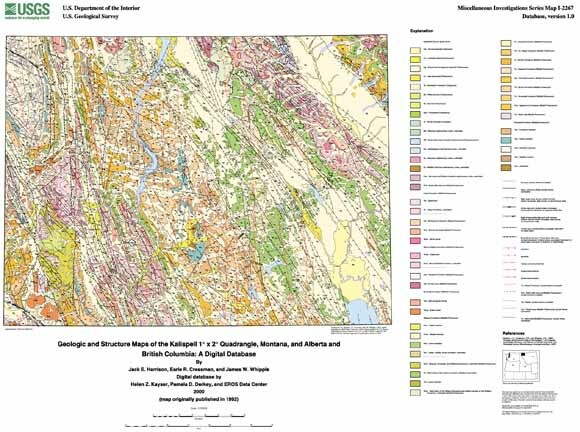 The geologic map of the Kalispell 1 x 2 degree quadrangle (Harrison and others, 1992) was originally digitized by staff at the U.S. Geological Survey's Earth Resources Observation Systems (EROS) Data Center prior to 1994 and completed by U.S. Geological Survey staff and contractors at the Spokane Field Office (Wash.) in 2000 for input into a geographic information system (GIS). The resulting ArcInfo digital geologic map database can be queried in many ways to produce a variety of geologic maps. Digital base map data files (topography, roads, towns, rivers and lakes, etc.) are not included: they may be obtained from a variety of commercial and government sources. This database is not meant to be used or displayed at any scale larger than 1:250,000 (e.g., 1:100,000 or 1:24,000). The map area is located primarily in northwest Montana. This report describes the methods used to convert the geologic map data into a digital format, the ArcInfo GIS file structures and relationships, and explains how to download the digital files from the U.S. Geological Survey public access World Wide Web site on the Internet. Please refer to (Harrison and others, 1992) for unit descriptions and a discussion of the geology and structure. Download the pamphlet for the map as a 24-page PDF file (kal2267-pamphlet.pdf; 944 KB). Download the map as a ~38" x 28" PDF file (kal250k-map.pdf; 2.8 MB).